I had another arachnid encounter this morning in the garage. Some of you might remember that I have an aversion to spiders that borders on a phobia, and today’s Traumatic Event just moved me one step closer to the padded room in my future. I was in a hurry (typical morning), rushing out the door with arms full, herding the kids along in front of me. They got into the car, and I hit the button to raise the garage door as I simultaneously rummaged in my purse for keys. I secured the door, then looked up, only to lock eyes with a deep brown spider the size of a schnauzer dangling hideously from the edge of the garage door as it rose on its rumbling way along its tracks. 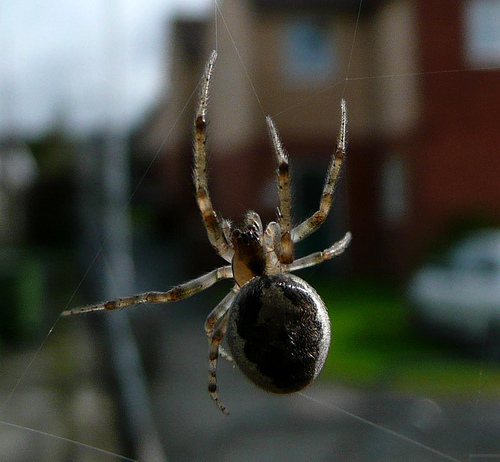 It wasn’t one of the flat, skittery garden spiders we’ve been seeing off and on all summer. Those are about as big as a nickel, unpleasant but easy to squish with a shoe. This sucker was… well, bulbous. Grotesque. Juicy. And, like her grandmother Shelob, she was clearly waiting to make a dinner out of the first unwary victim to pass her way. Even now, imagining how close I came to just walking into its trap without seeing it, I get a major case of the heebie jeebies. Instead, I grabbed the closest weapon to hand, a bottle of weed-killer, and started spraying the beast like mad. It finally fell, and I thought it would die quickly in the puddle of poison that was accumulating on the garage floor. But it didn’t. It kept going. And going. And going. Soon it became obvious that the monster was impervious to weed-killer. In fact, I think I saw it grow even bigger, like the Incredible Hulk. I was going to have to smash it. Unfortunately, I couldn’t bring myself to step on it. Did I mention how fat it was, or how it was dragging its great abdomen around behind it like a pendulous water balloon filled with spider juice? I didn’t want that on my shoe. So I cast around for something I could use to squish it. A few chunks of leftover lumber from Paul and Jim’s shelving project leaned in the corner, so I snatched one and dropped it on the fiend. What happened next can only be the fevered imaginings of an adrenalin-soaked brain, but I promise you, I saw it. “Would you just die already?” I howled, and jumped on the board with both feet, bracing myself for the gusher of bug guts I knew was coming. It never came. I scraped the board along the garage floor, imagining myself grinding the hideous creature into paste. But I didn’t lift up the board and check. Why didn’t I check? It’s haunting me. The worst part of this story happened this afternoon. I came home from work to find Paul beating the bushes beside our front door with a rake. Apparently, while coming down our stairs, he spotted something through the front door window: a giant spider busily spinning its web across the front porch. He had just finished dispatching it when we pulled up. When he described it, it sounded exactly like the one I saw this morning. I imagine two possibilities, both disturbing. Either the spider I thought I killed this morning somehow survived being sprayed and swatted, and spent the day plotting its revenge by spinning a human-catcher across our front door, or we are under attack, and somewhere, lying in wait, is an army of fat-bodied, mandible-snapping, eight-legged horrors, patiently watching for their chance to bring down some game of the two-legged kind. Either way, I’ve got to get some better weapons. Why did Hazel have to lick my leg while I was reading that? Why why WHY!!!??? Ok, enough about me. Yuck yuck and yuck. I’m glad you’re ok. Spider encounters are traumatic to say the least. At least you have the guts to kill them when you see them. I’m usually paralyzed with fear! Haha! Hazel must have been reading over your shoulder and recognized an opportunity to freak you out. She’s very sneaky. Wow! You took and posted a picture! That’s a big step for any true arachnophobe. Won’t be long till you’re catching them in a jar for a pet…or at least show and tell. Unfortunately, I didn’t have time to take a picture of my spider. This is some internet spider that I googled, but it looks a lot like mine. I actually did think about taking a picture with my phone, but the spider looked like it was going to get away, and I decided the cause of preventing it from crawling off into a hidey-hole and giving birth to hundreds of other spiders in my garage was more important than getting an accurate blog photo. Here at our new home we have been dealing with black widow spiders, of all sizes, mind you!!! Talk about being freaked out….we not only get the heebie jeebies, but we could potentially be bitten & poisoned! Oh the terror…. My kids who generally like to check-out our local bug population when they into contact with it, now run in fear for their lives because their daddy (not me) has made them so scared that they truly believe that if they get within 2 feet of the offending black widow (or a spider in general since they are apparently ALL as dangerous as a black widow) they will surely be bitten and die! Makes me laugh a little bit because he gets WAY more freaked out by spiders than I do 🙂 Not to say that I enjoy coming into contact with an 8-legged crawly creature, but I just smash it & go, haha! !